Since temperatures dip as the days of October pass, provide your guests with hearty fare that fills their stomachs and warms their blood. Serve foods with an orange glow like pumpkin ravioli, buffalo chicken wings or lasagna to create a pleasing presentation on the plate. 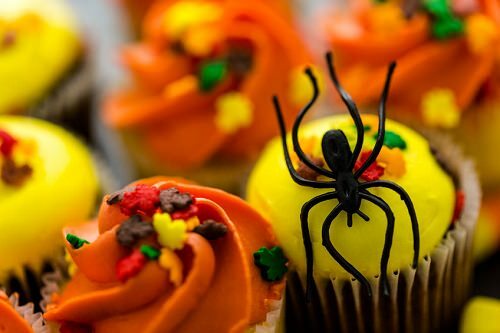 Select a wedding cake decorated with a witch and warlock on top instead of the traditional bride and groom or serve Halloween cupcakes arranged on tiered trays instead of the traditional wedding cake.